TREADLY BIKE HIRE IS THE MOST VERSATILE, COMPACT AND FUNCTIONAL BICYCLE HIRE SYSTEM IN ADELAIDE, AUSTRALIA. Treadly Bike Hire gives tourists, visitors and residents of Adelaide quick and easy access when and where they need it. TREADLY BIKE HIRE IS THE MOST VERSATILE, COMPACT AND FUNCTIONAL BICYCLE HIRE SYSTEM IN AUSTRALIA. 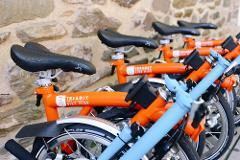 Treadly Bike Hire gives tourists, visitors and residents of Adelaide quick and easy access when and where they need it.